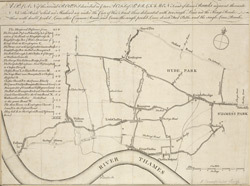 The title of this road map of Kensington and Chelsea appears in a panel above the plan, with the compass star at top right and scale bar at bottom left. The roads within the Kensington and Hyde Park Trust are indicated by a shadowed line; the king's private roads by a double line; the common roads by a double dotted line; and the footpaths by a single dotted line. Turnpikes and junctions are lettered for reference with distances given in a table down the left side of the plate.